MENLO PARK, CA - TechShop, the national chain of membership-based workshop and fabrication studios, is finding a niche as a business incubator for wood products firms, and other businesses. Providing low-cost access to production centers for prototyping and manufacturing, wood products and other businesses have used its locations - it's in six locations with three more pending. TechShop's 4,000 members pay around $1,395 a year in dues, or can buy a one month membership for about $175. TechShop offers CNC machines, and such woodshop staples as bandsaws and tablesaws, laser cutters and routers. Rather than risk outfitting a manufacturing space during a product launch, entrepreneurs can use the facilities for prototyping and short run production. 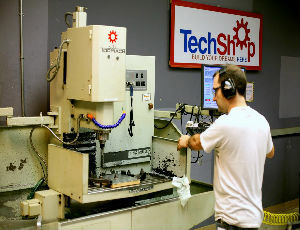 Even during the downturn, TechShop managed to expand, its most recent opening in Pittsburgh in March. The chain took a hit when the company closed its North Carolina shop in April. But with six stores and three more in development, along with a number of prestigious accolades, this past year has been largely positive for TechShop. The business is prized for its ability to incubate business start-ups, including woodworking businesses, who rent its production facilities. Among notable success stories are DODOcase, the multi-million dollar iPad wood case firm in San Francisco - which used its space for several months during its start-up. TechShop was named Innovator of the Year by the Dearborn, MI Chamber of Commerce for its business plan. TechShop's expand in Round Rock, TX, where it located adjacent to Lowe's home improvement stores, Round Rock, TX location as part of a collaboration between the two companies. Lowe's provided TechShop with all of its materials along with an entrance attached to the store. The success of that partnership lead to the opening of the TechShop in Pittsburgh, where the city council dubbed March 26, 2013 TechShop day. TechShop agreed to open at Arizona State University, in Chandler. Students will receive free memberships. AutoDesk partnered with TechShop, making Inventor software available free on a trial basis. TechShop has also partnered with the Veterans Administration, in the VA Innovation Initiative (VAi2) to find new ways of providing veterans with resources to serve an important role in America’s economy. Through this partnership, 2,000 one-year memberships are to be made available to American veterans.